I can't believe it is MAY! Where is the time going?! I love that it is spring and almost summer, but sometimes I wish time would stand still for a moment so I could take life in a little more. We went on a walk yesterday afternoon and it was so nice to watch the kids enjoy the simple things of nature, to hear the birds, see the beautiful colors, pick the tall grass, and just feel alive. These are the moments I treasure, the moments that matter, the moments that connect me with my family, and even my own childhood. They make me happy. In a word? Simplicity. It seems lost in this busy busy world! Ok, enough getting caught away with my emotions. :) As I have been working on my Master Bedroom there is one project that I knew I needed. A jewelry holder. So in my normal fashion of not wanting to spend any money, I looked around the house/shed and found some supplies that would work for making one. 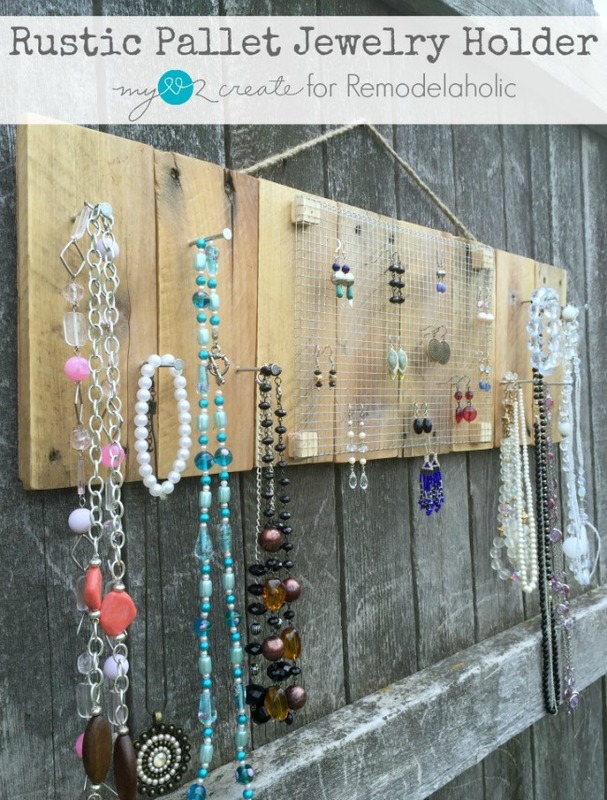 I came up with this Rustic Pallet Jewelry Holder, and I LOVE it! This was a quick and easy project, and if you are still in need of a Mother's day gift it just might fit the bill! I am sharing the tutorial over at Remodelaholic today so please go check it out! Mindi, this is so simple and at the same time so pretty and practical! Love it! I hear ya about slowing down and simplicity. Notice my lack of blog post. : / I don't want to miss those family moments that can get blurred with everyday life. I am pausing and reflecting more and then seeing where that leads. Wow! Love this idea too! My jewelry is all piled into a couple of little jewelry boxes, and this would be a perfect way to keep them organized. Love your site! Found you from the Home Party, and glad I did! I love jewelry. I have a big, fat, jewelry loving problem. I have a ton of it, but I continue to buy more because I swear out of the 5,000 necklaces I do have, not a single one of them goes with my favorite dress or that new sweater I just bought. The worst, though, is when I can't find the one necklace or pair of earrings that I know is perfect for my outfit because nothing is very organized!